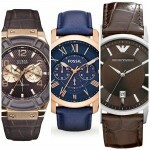 Hello, today I figured it would be nice to check out some of the popular watches available from August Steiner. 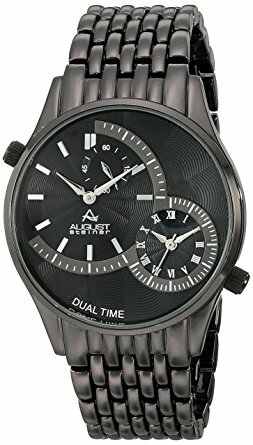 This is a brand that has a huge selection of styles and designs available, many of which are very affordable so perfect for this site that loves to feature affordable watches. 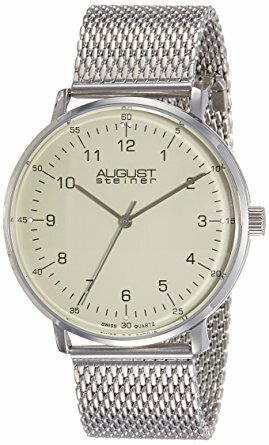 Are August Steiner Watches Good? 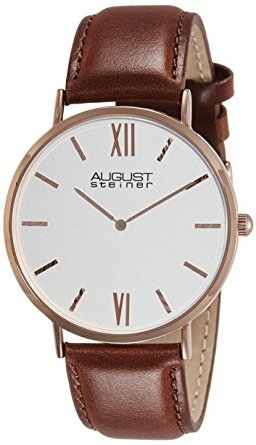 So are August Steiner watches good? It’s a fair question that gets asked pretty often. 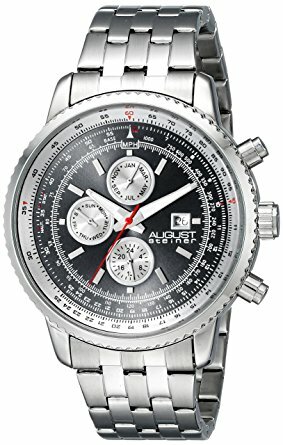 August Steiner watches are made by the same company that produces Akribos XXIV watches. I actually had the chance to get a hands on look at 20 of the Akribos watches recently and was really pleased with the overall quality of them. 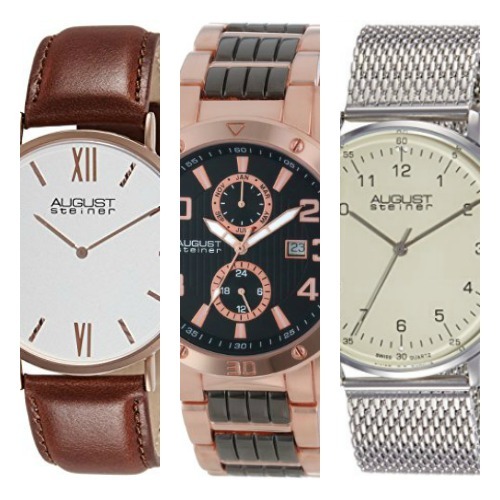 August Steiner have a similar ethos of producing affordable quality watches in a wide variety of designs aiming to have something suitable for everyone. Obviously, as they’re more of an affordable brand I wouldn’t expect the highest levels of quality, but for the price I’d say they’re very fair. Below I’ve featured a small example of some of their most popular models currently available to give you an idea of what it is the August Steiner brand offers. If you have any questions about any of the watches featured just comment below and I’ll try and get back to you as soon as possible. First up on today’s list of the most popular August Steiner watches for men is this interesting minimal looking timepiece. The casing of this watch is made of stainless steel and has a diameter of 44mm and a thickness of 12mm making this quite a large watch. The strap is also made of stainless steel and has this nice milanese mesh style design to it and fastens with a jewellery type clasp. The dial has a minimalist design to it with this soft cream coloured background and neat looking numeral style hour markers and slim baton style markers. Powering this August Steiner watch is a Swiss quartz movement for reliable and accurate timekeeping. A mineral crystal glass has been specially hardened to offer a good level of scratch and shatter protection. This watch has a basic 30m water resistance rating. You can read my full August Steiner watch review here soon. Next up on our list of the most popular August Steiner watches for men is this popular chronograph timepiece. It has a large 46mm stainless steel casing that has a thickness of 11mm. It’s been paired up with a stainless steel strap and fastens with a fold over clasp that includes a safety catch. The dial has quite a lot of information going on . There are 3 sub dials displaying the month, day of the week GMT 24 hour as well as a date display at the 3 o’clock position. The hands have a small coating of lume for better visibility in dim lit conditions. Powering this August Steiner watch is a Swiss made quartz movement for accurate and reliable timekeeping. A mineral crystal glass protects from scratches and shattering. This model has a basic water resistance rating. You can read my full AS8162SSB August Steiner watch review here soon. 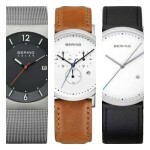 Here we have another popular minimalist August Steiner watch. This model has a 44mm stainless steel PVD rose plated casing that has a thickness of 7mm making this quite a slim men’s watch. The strap is made of a soft genuine leather in brown and fastens with a buckle style clasp. The dial has a minimalist design to it with this large white background and PVD rose gold plated detailing for the hands and baton style hour markers. I really like this type of minimal design similar to what you find on Daniel Wellington watches. At the heart of this August Steiner watch is a quartz movement for reliable and accurate timekeeping. The mineral crystal glass has been specially hardened and has a sapphire coated for better scratch protection. The basic 30m water resistance rating is good to have too. You can read my full AS8166RGBR August Steiner watches review here soon. In at number 4 we have a popular affordable PVD rose tone August Steiner watch. It features this large 46mm stainless steel PVD rose gold plated casing that has a thickness of 11mm. The strap has a two tone design and is made of stainless steel, it fastens with a fold over clasp. The dial features two subdials that display the month of the year and a GMT 24 hour timer. There’s also a small date display located at the 3 o’clock position. They’ve used a mixture of numeral and baton style hour markers with rose gold coloured detailing. Of course if you’re looking for the best GMT watch you should read the linked post. At the heart of this August Steiner watch is a Swiss made quartz movement for accurate and reliable timekeeping. The front glass lens of made of a specially hardened mineral crystal glass to give you a good level of scratch and shatter resistance. The water resistance rating of this model is 30m. You can read my full AS8070RG August Steiner watch review here soon. Last up on today’s list of the most popular August Steiner watches is this stunning all black version. 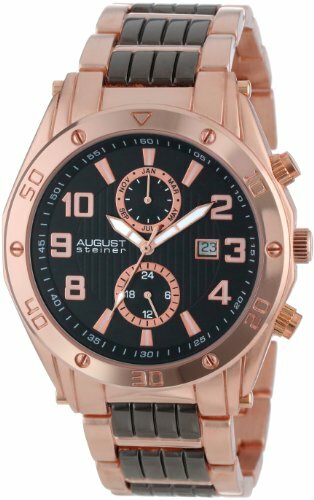 This men’s August Steiner watch has a 42mm black flashed alloy casing that has a thickness of 11mm. It’s been matched up with a black flashed alloy strap that fastens with a fold over clasp. I really like the interesting dial design on this black August Steiner watch. The dial has an engraved sunburst guilloche design to it and features two time zones for a dual display as well as a separate subdial to display the seconds. They’ve used a combination of silver-tone baton and Roman numeral style hour markers. A reliable quartz movement powers this watch to give you accurate timekeeping. They’ve used a mineral crystal glass for a good level of scratch and shatter resistance. It also has a basic water resistance rating. You can read my full AS8141BK August Steiner watches review here soon. 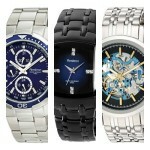 Thanks for taking the time to read through today’s August Steiner watches review. What was your favourite August Steiner watch featured? Comment below and let me know.